The renowned astrophysicist talked to KFU audience on August 2nd. Dr. Sunyaev’s interests are quite varied. In particular, he and his research consultant Yakov Zeldovich proposed what is known as the Sunyaev-Zeldovich effect, which is due to electrons associated with gas in galaxy clusters scattering the cosmic microwave background radiation. 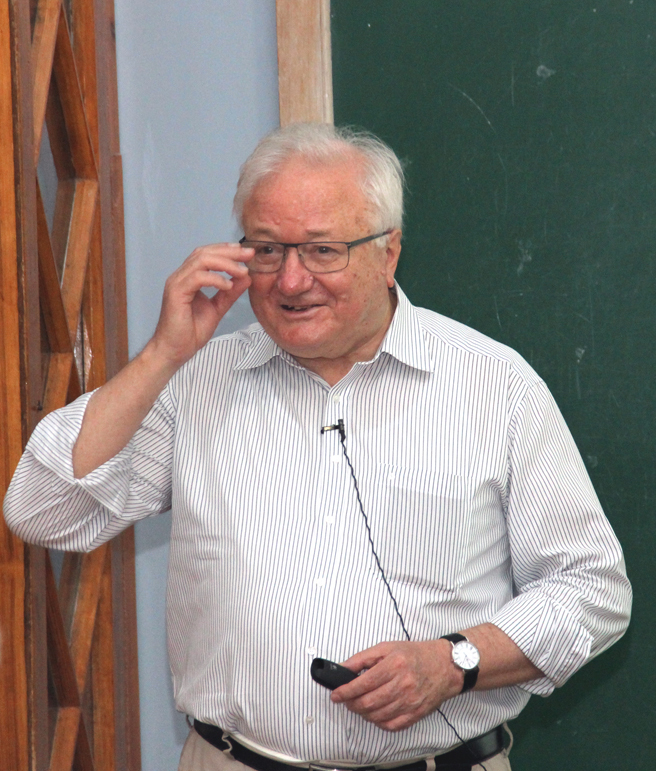 Sunyaev and Nikolay Shakura developed a model of accretion onto black holes, from a disk, and he has proposed a signature for X-radiation from matter spiraling into a black hole. He has collaborated in important studies of the early universe, including the recombination of hydrogen and the formation of the cosmic microwave background radiation. Spektr-RG is a high-energy astrophysics observatory. Its two main instruments are eROSITA and ART-XC telescopes – Dr. Sunyaev spoke in detail about their very impressive technical capabilities. The launch is planned in September 2018 from Baykonur, Kazakhstan. The first three months will be dedicated to flying the L2 point, calibration of payload, and performance verification. The next four years will be taken by 8 all-sky surveys with 6 scanning rotations per day. Finally, another 3 years will be dedicated to follow-up observations of the most interesting galaxy clusters, active galactic nuclei, and other discovered objects. Among other things, Spektr-RG can provide a detailed view of the compact object population of the Milky Way (such as neutron stars), survey about 700 thousand active stars, study nearby star-forming galaxies and galaxy groups, map the diffuse X-ray emission and the hot interstellar medium in the Milky Way and in the Solar neighborhood, and provide a dynamical view of the X-ray sky and identify transients and variable sources. The renowned guest mentioned more than once that young minds are very welcome to join the project on the Russian side. Much data will need filtering in the course of this very important project, and automated systems alone are not enough.